Anyway, after my run, I sat in the sun and read the Nook, which is my new favorite gadget. My mom, being the wonderful person that she is, sent her Nook with Isaac so that I could use it for the remainder of my time in France. I never had much interest in having an eBook reader, but, holy cow, this thing is amazing! I’ve already read 12 books on it. It’s so convenient! I will definitely have to get one of these for myself when I get home. Just like at home... but with pink and white marshmallows! and I got to mixing! 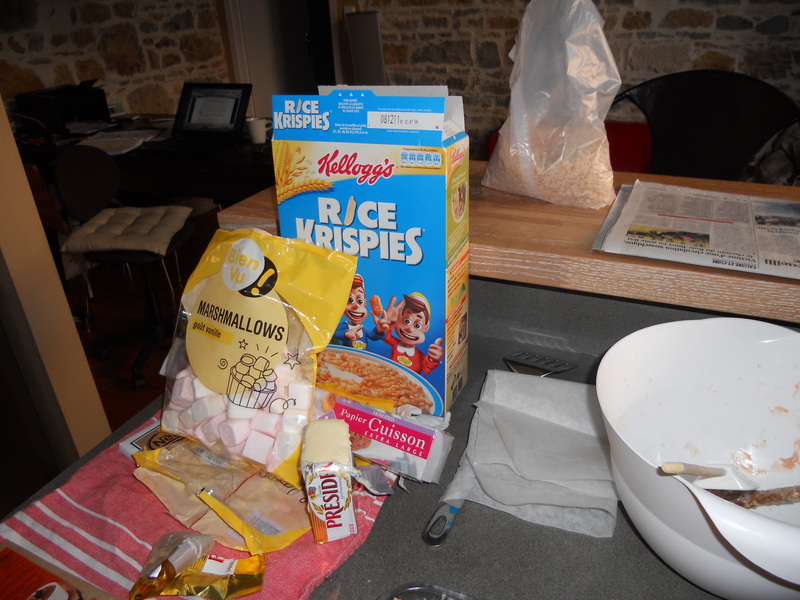 Since we had to estimate amounts (measuring cups are a little different over here, and the marshmallows were a little small), the rice krispie treats ended up being a little dry. 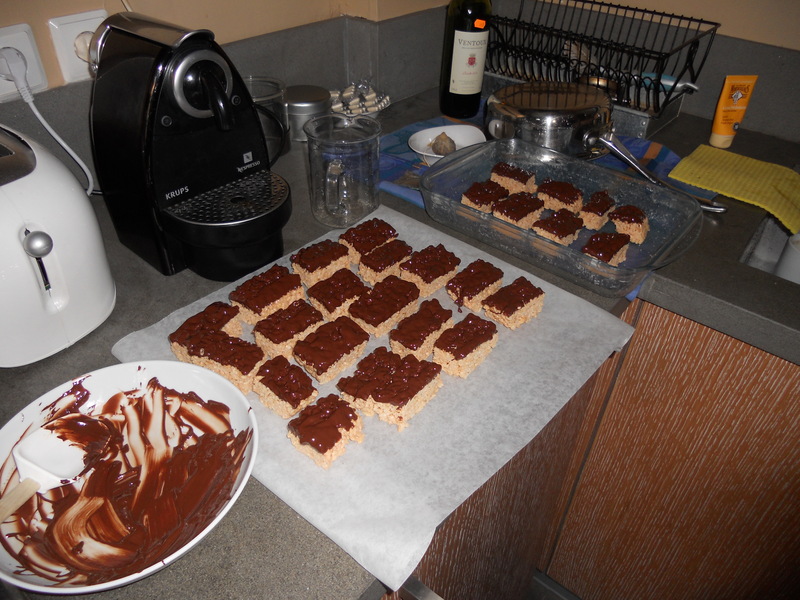 So, we decided to jazz them up a bit with some chocolate. We heated up some dark chocolate and dipped them in it. 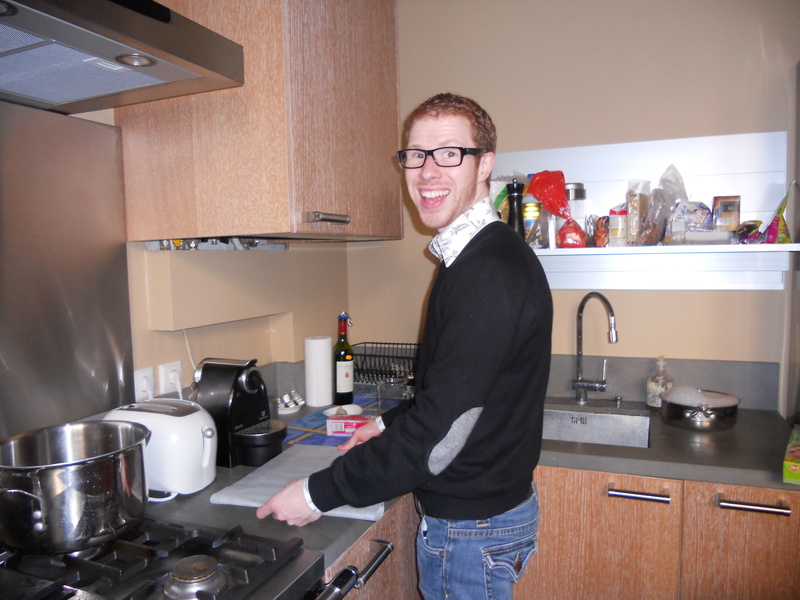 Colton prepares the work surface. 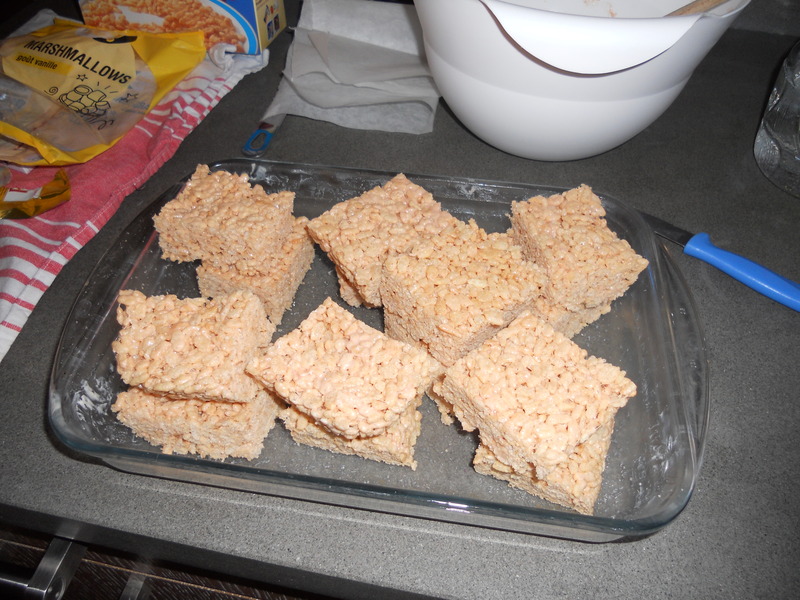 Chocolate covered rice krispie treats! We also decided we would drizzle them with white chocolate to make them even more exciting, so Colton prepared the white chocolate. 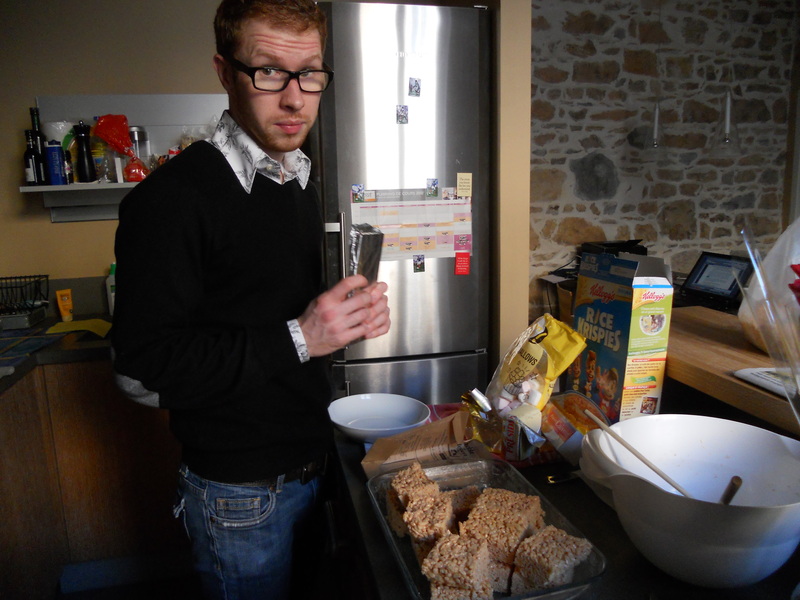 Colton takes his baking seriously. Unfortunately, we had some difficulties with the white chocolate, so had to settle for just the dark chocolate. The white chocolate refused to melt enough for us to drizzle. But they were still pretty good, even with just the dark chocolate. This week, I had about 20 hours of class (this week – international labor law!) and went to 2 operas. I battled the flu this week, which wasn’t enjoyable. But, I rested a lot and was able to make it to the operas – the last of my French opera series! On Tuesday, Colton and I went to Figarro, which was pretty good, and on Wednesday, we went to Don Giovanni, which was very intense and was the best opera I have seen in Europe. On Thursday, St. Patrick’s Day, C² took me out to celebrate my birthday (Cynthia had a friend in town on Friday and didn’t think her friend would want to celebrate my birthday; I think that friend sounds questionable. I mean, who wouldn’t want to celebrate MY birthday??). 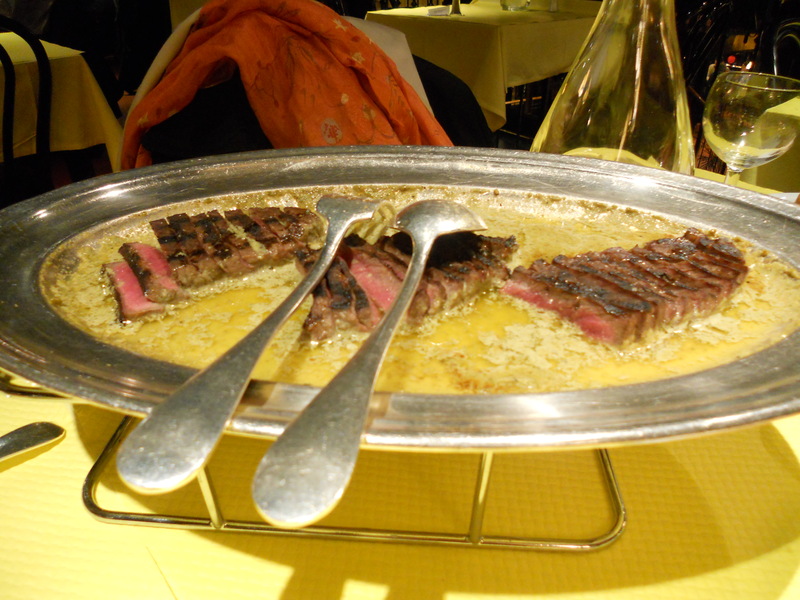 We went to my favorite restaurant in Lyon, L’Entrecôte. 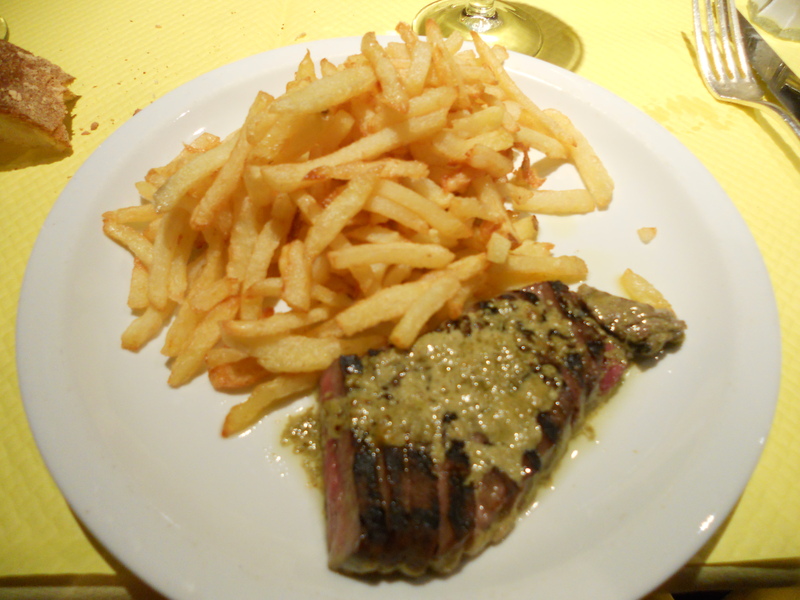 They only serve one meal at this restaurant, steak frites, and they serve it very well! You get unlimited fries plus two servings of some of the best tasting steak I’ve ever had. The additional servings of steak. I definitely need to figure out how they cook those fries and that steak. Because they don’t serve Coca Light at this restaurant (according to the waitress, this is because the meal is fattening, so why would you order a diet drink… don’t you love that logic), we are always forced to enjoy a bottle of wine when we dine here. Darn. 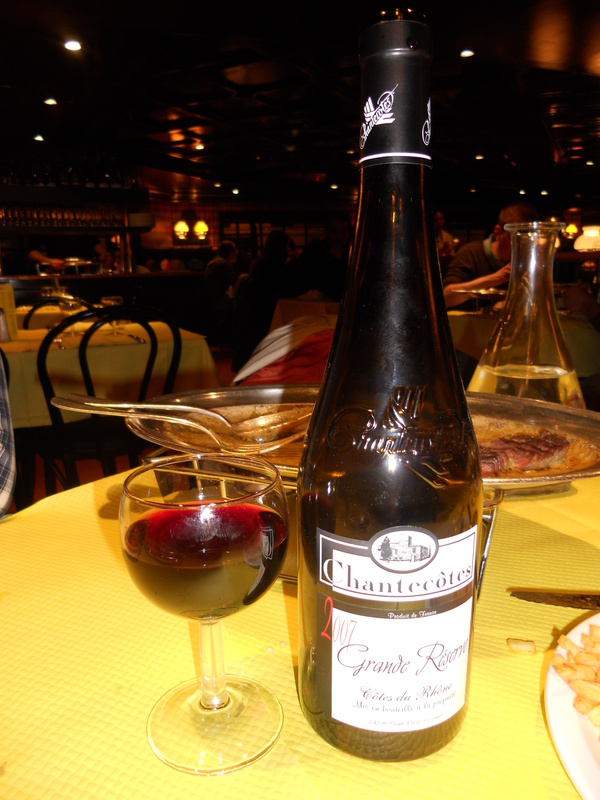 The local wine, the Côte du Rhône. 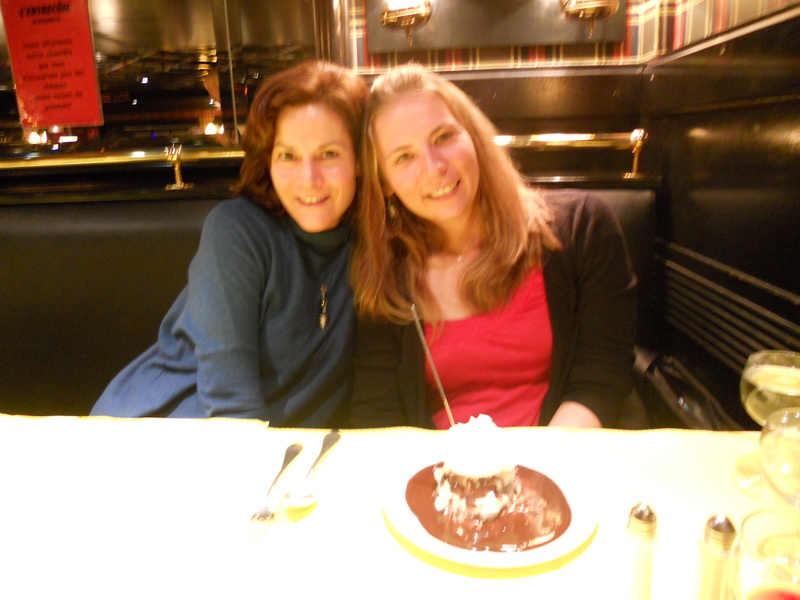 Since we were celebrating a birthday, we had to get dessert, which they nicely brought out with a sparkler in it! We didn't capture a photo with the sparkler going (I was too slow), but I love this photo of me and Cynthia. Celebrating Birthday Eve with my favorite people in France. In France, they like to feel close to what they are eating. It cracks me up. 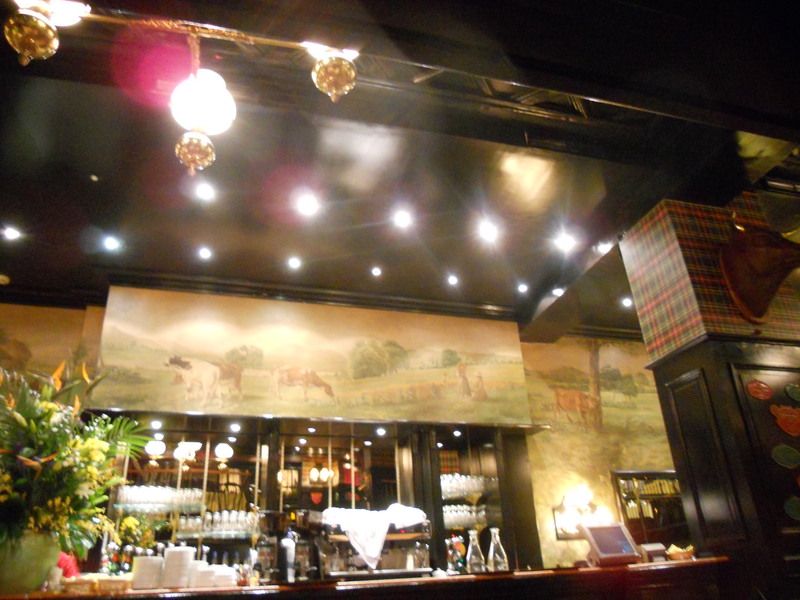 So, in this steak restaurant, they have paintings of cows everywhere! Happy cows make for good steak? On my actual birthday (hello 28! ), Colton and I went to dinner at another of our favorite restaurants (which we seem to eat at every week or so), BIEH, Best I Ever Had. It’s an American diner which serves wonderful hamburgers. Yum! Then, we headed to Colton’s favorite cocktail bar, Soda ‘n Soul. He kept saying they had the best cocktails. I didn’t really believe him until I tried them. They really were delicious. 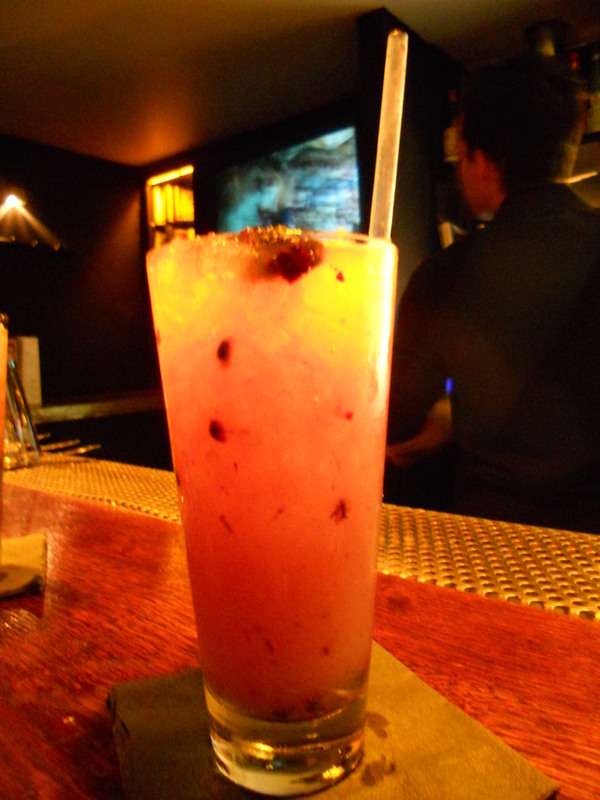 First, I started off with a pear, vodka and fresh blackberry drink. 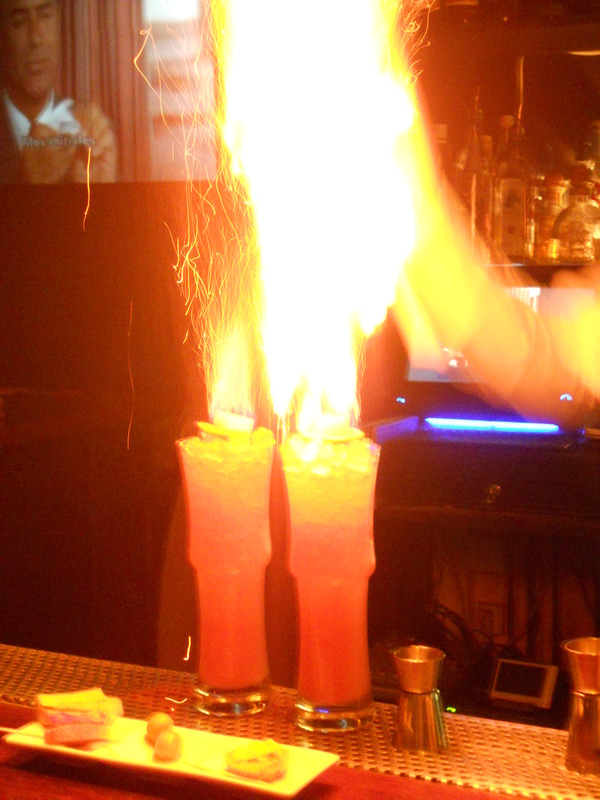 Then, after watching the bartender light a number of drinks on fire, I decided I had to try the firey cocktail. So, for our second round, Colton and I ordered Zombies, which were made of various rums with a sugar cube on top doused in absinthe and lit on fire. After I got over how strong they were, they tasted great. 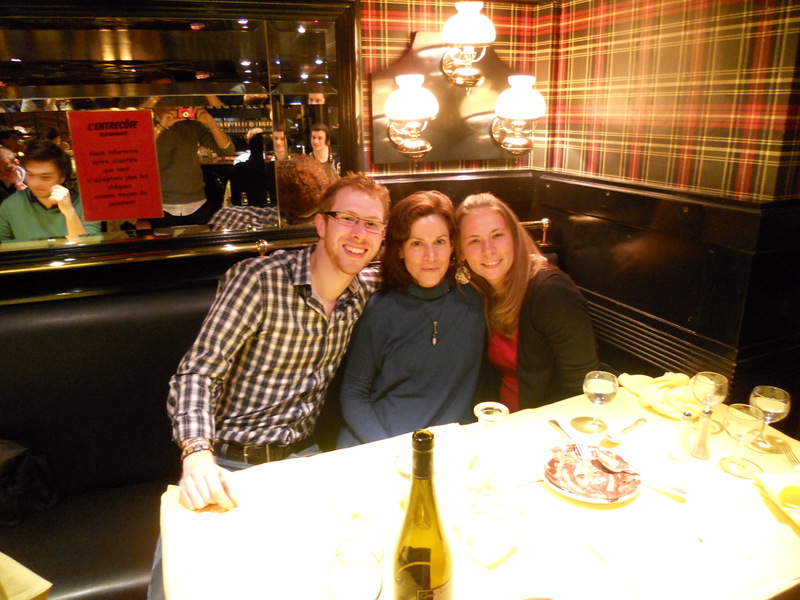 While we were there, a couple of friends from our program joined us (and one brought her French boyfriend). 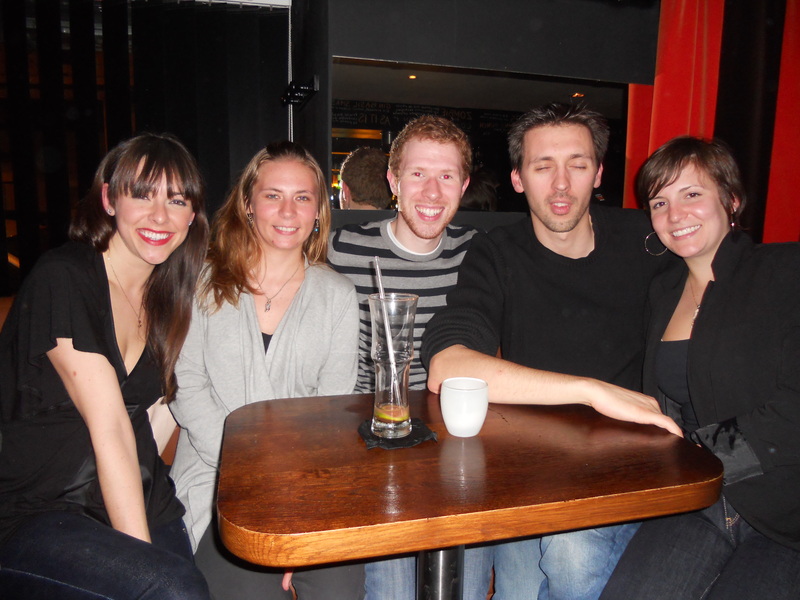 Caitlin (from BU), me, Colton, Fred (the French boyfriend), and Lauren (from LSU). This was the first time that I had hung out with fellow LLM students other than C² and I really enjoyed it! I’m going to have to try to make time to hang out with them more in my last couple of weeks here. Overall, I had a wonderful birthday! I’m still looking forward to all of the belated birthday celebrations when I get home, of course, but this was definitely not a bad way to spend a birthday in France! Today, I planned to complete my labor law examination so I could relax on Sunday. However, my plans went a bit awry. I woke up about 10am and headed downstairs to make myself some breakfast. On my way down the stairs, I slipped, fell down the stairs and slammed my foot into the bottom stair. I am not sure that I have ever experienced that much pain. After spending a good hour sobbing, I pulled myself back upstairs, messaged Colton and Cynthia and waited for someone to get back to me. Finally, Colton saw my message and came up with a plan. He called his “French mom” and asked for advice. She said that we needed to go to the pharmacist (pharmacists here do a lot more than just dispense drugs). So, we found one that was open (harder than it sounds) and planned to meet one metro stop away from me. I dragged myself over there very slowly (and managed not to cry on the way – also harder than it sounds), but, upon getting there, the pharmacist told us we needed to go to the hospital instead. So, we caught a tram and went to the nearest hospital…. where we waited… and waited… and waited… It took us about 4 hours before we were seen. *sigh* Finally, they called me back, took an x-ray and confirmed what I had thought – I broke the middle toe on my right foot. They taped it up and regretfully told me that I am just going to be in pain for a while, but it should heal on its own in about three weeks. Good times. I managed to get through my first 28 years on earth without a single broken bone. I guess the streak had to end sometime! I just wish it didn’t have to end while in France where I have to walk a lot and have some big plans coming up. Oh well – I guess that’s what I get for making plans! On the plus side, my bill without insurance for the entire visit, including the x-rays, was under 80 euros! My copay alone at home would have been at least that much.